The Long Bar. The Looooooooooooooooong Bar. Most large cities have them. A favorite watering hole for watching Your Team. Ours can also be a favorite with your jewelry customers. A 14/20 Gold Filled 3X40mm 24 Gauge Long Bar Blank Drop with a 1.1mm Inside Diameter Hole. 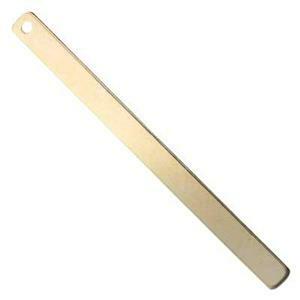 Available in a heavier 20 gauge 3x40mm gold filled bar blank version as item GF2607T. Salted nuts are strictly optional. Love this long bar blank! I use it on a lot of my lariat necklaces and my customers love it.